“We may be dealing with the one of the largest floods that ever occurred on our planet,” said the lead author of the study. It was the most abrupt environmental change, at a planetary scale, since the end of the Cretaceous, says Discover magazine. One of the largest floods in Earth’s history may have deluged the Mediterranean Sea more than 5.3 million years ago, leaving behind a mass of debris roughly the size of Greece’s largest island, Crete, researchers say. Scientists investigated a roughly 640,000-year span of time starting nearly 6 million years ago when the Mediterranean became a hyper-salty lake. This so-called Messinian salinity crisis “was the most abrupt environmental change, at a planetary scale, since the end of the Cretaceous — that is, a sudden mass extinction, including dinosaurs, due to a meteorite impact,” said study lead author Aaron Micallef, a marine geoscientist at the University of Malta. This event happened because the Mediterranean became isolated from the Atlantic Ocean. The dry climate of the region caused the Mediterranean to evaporate almost completely, with sea levels there dropping by up to 7,800 feet. During this time, a layer of salt up nearly 1 mile thick was deposited at the bottom of the Mediterranean Sea, equivalent to 5 percent of global salt mass of the oceans. “The Messinian salinity crisis thus reduced global ocean salinity and had an impact on ocean circulation, ice formation and, thus, climate,” says Micallef. Previous research suggested the Mediterranean was abruptly restored back to a normal sea at the end of this event. One theory to explain the refilling of the Mediterranean was a catastrophic flood through what is now the Strait of Gibraltar. During this so-called Zanclean megaflood, prior work suggested that 90 percent of the Mediterranean refilled within a few months to two years, with the sea’s waters rising by up to more than 10 meters per day. Until now, conclusive evidence of debris from this megaflood had eluded scientists. To look for the aftermath of this catastrophe, Micallef and his colleagues analyzed the boundary between the western and eastern Mediterranean Sea, which is marked by a 155-mile-long and more than 1-mile-high limestone cliff called the Malta Escarpment. “If the Zanclean flood did ever occur, it should have left a mark either on this cliff, or at least at its base,” says Micallef. Even today, the Mediterranean is considerably saltier than the North Atlantic due to its near isolation by the Strait of Gibraltar and its high rate of evaporation. 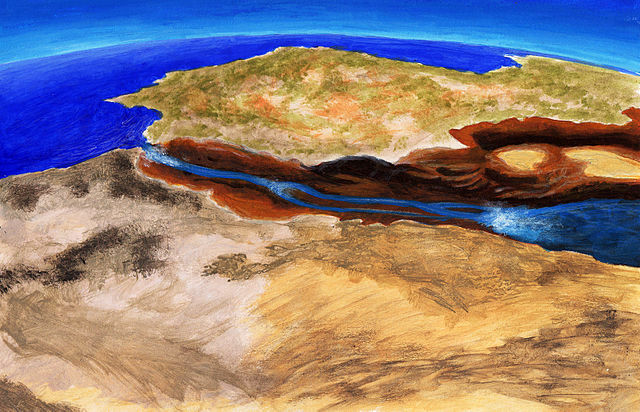 If the Strait of Gibraltar closes again (which is likely to happen in the near future on a geological time scale), the Mediterranean would mostly evaporate in about a thousand years, after which continued northward movement of Africa may obliterate the Mediterranean altogether. Odd. Sure I read about ruins of ancient buildings found under the Med. While in the army back in the late 1950’s I spent three years in Cyprus. Channel Islands, so would have noticed. ‘Noah’s Flood’ Kick-started European Farming? It mentions flooding of the Mediterranean 8,000 years ago. A result of the collapse of the Laurentide Ice Sheet. Only the inflow of Atlantic water maintains the present Mediterranean level. Quote: Mediterranean hydrodynamics are driven by three layers of water masses: a surface layer, an intermediate layer, and a deep layer that sinks to the bottom. The intermediate layer is infused with warm and saline water coming from the eastern Mediterranean and is characterized by temperature and salinity maxima at 1,300 feet (400 metres). 5% of ocean salinity is a lot for a small sea to hold. Shores have risen and fallen due to earthquakes and still are doing so. But what is the point of this paper. What was the cost/benefit of doing the research and writing it.? Until now, conclusive evidence of debris from this megaflood had eluded scientists. Now they have it, or believe they do. The Med salinity crisis was first found by the Glomar Challenger (vide Kenneth Hsu ‘The Mediterranean was a desert’ ). That was said in the book to be about 5M yrs ago. Note in fig10 and others the black ‘sapropel’ deposits and the dates. These correspond – and corroborate – events of cataclysmic nature in the holocene. The origin of those organic sources are likely not marine but from land vegetation. The pic in link below (wrk in prog) ties the various layers together and to particular dates. It is additional proof of global events, nearer to us than the salinity crisis.